If you're a fan of plain designs, you're probably going to hate 2014 Topps Fire Football. However, if you're intrigued by something that isn't business as usual in the design department, it might be a different story. Hobby boxes of the debuting brand come with a pair of autographs and two relic cards. The 2014 Topps Fire Football base set has 150 cards. This breaks down to 100 current and retired greats, and 50 rookies. Parallels are plentiful, with at least two in every pack. They include Fire Wood (one per pack), Flame Foil (one per pack), Purple (#/499), Blue (#/299), Green (#/99), Gold (#/50), Onyx (#/25) and hobby-only Red (1/1). Autographed Rookies are essentially signed versions of their base cards. The checklist has more than 40 players. Parallels come in the form of Green (#/75), Gold (#/50), Onyx (#/25) and Red (1/1). 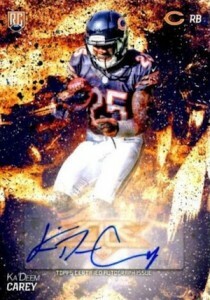 2014 Topps Fire Football also has about 50 Veteran Autographs. All are numbered but to varying quantities. Dual Autographs (#/25) and Triple Autographs (#/15) have a mix of rookie and veteran signers. Rookie Autograph Patches are extremely tough and come with a variety of one-of-one swatches like Nike Swooshes, laundry tags and NFL Shields. Dual (#/10) and Triple (#/5) Autographed Relics come with signatures and swatches from multiple players. Both have one-of-one Patch parallels. The majority of the product's memorabilia cards are Fire Relics. More than 40 players are in the set, which includes Green (#/75), Gold (#/50), Onyx (#/25) and Red (1/1) parallels. 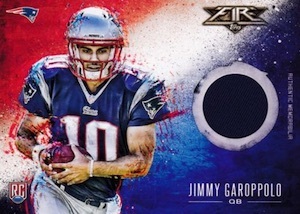 Fire Jumbo Patches (#/15) come with larger swatches while Dual Combo Patches (#/25) have pieces from a pair of players. Both have Onyx (#/5) and Red (1/1) versions. 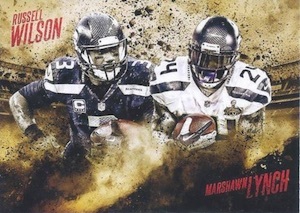 2014 Topps Fire Football has a quartet of basic insert sets that carry the burning theme. Out of This World Rookies (25 cards, 1:5 packs) features top first-year talent and casts them against strange, almost apocalyptic landscapes. Numbered Red parallels are a case hit. Forged by Fire (35 cards, 1:10) is another rookie-focused set, this time die-cut. Competitive Fire (30 cards, 1:10) spotlights teammates and rivals with a mix of rookies, active players and retired greats. 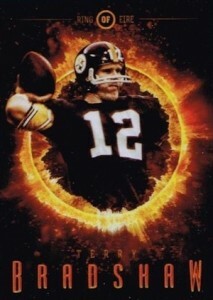 Ring of Fire (ten cards, 1:20 packs) isn't a tribute to Johnny Cash. Rather, the hobby-exclusive insert features players who have won at least one Super Bowl. 150 cards. Cards #101-105 don't exist. Shop for base sets on eBay. Good: Vibrant designs, good variety of cards in each box, four hits. Bad: Sticker autographs, disappointing base relic cards. The Bottom Line: 2014 Topps Fire may not live up to the hype campaign from Topps, but it is still a good option among the under-$100 box market. Love it or hate it, the base design is eye-catching and there are enough other elements present to yield a fulfilling break even if there are not really any huge hit possibilities. Bold colors and a mix of designs makes the Topps Fire base set one of the most intriguing options for set collectors in 2014. While all the designs do not necessarily evoke fire, especially when combined with the various background colors, the look is distinct enough to work for the brand while the variety in design prevents the staleness that can plague some products. 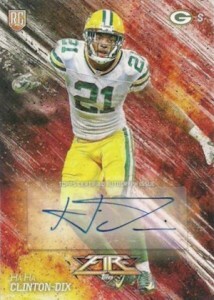 I enjoyed the Flame Foil parallels and given that they came one per pack, collectors will get their fill. The other parallels, all numbered, are a little more bland without the foil treatment, and would easily be missed if not for the fact that they are numbered on the card’s front. Several inserts continue the fire theme to some degree, but it would have been nice if they had included some additional finish, like etching or embossing, to take them to another level. Among the notable options, Forged By Fire die-cuts are solid but would be more captivating with a foil or Refractor finish. Also, Out of the World Rookies definitely has a Metal Universe feel to it, which is a good thing in my book, and would have looked terrific in foil. Ring of Fire features one of the best overall designs but is also the one that would have benefited most from an added Chrome/Refractor effect, ideally on the ring itself. Even with the strength of the base and insert designs, the hits were a little weak. It is beating a dead horse at this point, but sticker autographs are a real negative, especially on this captivating design. It feels like virtually no effort was made to incorporate the sticker into the design. Also, the base relics are very underwhelming in both design and the quality and size of the jersey piece. While it is not necessarily uncommon, I enjoyed pulling retired greats like Barry Sanders and John Elway alongside the current veteran and rookie base cards. However, the focus on the 2014 rookie class might be disappointing to those expecting a more even mix between rookie and veteran hit subjects. Although I did not pull one, the market was flooded with Fire Rookie Autographed Patches due to fact that many of the low and mid-level players had print runs of 500. This struck me as overkill, especially since many of the top rookie players, like Odell Beckham Jr., Sammy Watkins and Mike Evans, were limited to just 50. With prices around $65-75 per box, there are certainly cheaper options than 2014 Topps Fire, but a product like this is more about collecting value versus monetary value. Four hits may sound like a good haul, but sticker autographs and penny-sized relics don’t normally yield a good ROI. While I cannot speak to it firsthand, this does appear to be a good product to explore the retail options. 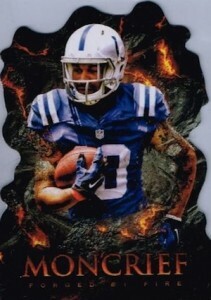 2014 Topps Fire might be the most fun of any 2014 football break thus far from a collecting standpoint. The box price is manageable and the collecting appeal is strong for those that enjoy base sets and inserts. It is a much harder sell if you are only interested in the hits, but that is because the box format is based on quantity over quality. If you are a collector that values base design and a variety of inserts, and views the autographs and relics more as icing on the cake, then Topps Fire burns for you. I don’t mind the design of the cards. But one thing stands out significantly. The stickers! A lot of times the sticker seems to blend in. Maybe it’s just how these cards are being presented here. Hopefully it’s not that bad live. But the design is growing on me. Awesomeness in the vein of Skybox Metal. Will buy. Sticker autos, a no go for me. I like the Valor design more than this one. These look fantastic. Something different and outside of the box in regards to trading card designs which are conservative and repetitive at times. Can’t wait to see them in person as the pictures are very low res here, is that just me noticing? George M. � The image mock-ups are what was passed along to us — definitely not the greatest quality but they give an idea of what to expect. These are the worst designed cards I have ever seen. It’s like they hired some clown from the instagram to add some modern effects to these cards. I appreciate good modern design when it is relevant and appropriate, but this looks bad. The artist who made these needs to stick to internet designs, because he or she clearly doesn’t realize how to do decent print based designs. Ive got to agree Jerry B. It looks like they took a bunch of factory pre set screen savers from a 1996 dell desk top PC. They need to quit worring so much about the “post card” back ground design and make a crisp, clean looking card with some sick GU/Patches and we’ll all be happy. But you can go ahead and ship that manziel and Wilson to my crib, ill go ahead and take those off your hands. Totally disagree with you Jerry. I can tell you’re not a designer or artist. The card game is so damn generic and boring, these are a fresh of breath air, something the memorabilia industry needs to. Take it what it is, these look great and far more creative than a player slapped on a standard gradient box or shaded background as we see too often. Keep the design work to the designers. lets just try and copy court kings topps just sell out already to someone who cares more about the hobby. And stop putting players in our product that are not in the NFL sorry you got the wrong guys to sign take it on the chin like a man and send them to a 3rd world country with water or just give them away to kids, not try to get your money back on our dime. Step it up or get out plain an simple! “Splash effect” they tried to do is a DEFINITE FAIL!!!! Terrance, you can’t fail a product based on a super low res sample. With these type of designs I can see a lot of detail in them so you have to wait until you see them in person before you can judge. Plain lazy, you’re the one kidding, most series of cards are so template driven where these are far more unique than any I’ve come across. If you like boring stuff then you won’t like these cards. So that might be your problem. Just got 2 boxes of these. All I can say is they’re FRESH! Nice to see a more creative theme of cards on the market. Probably the best looking cards I’ve ever purchased. The design is pretty nice but the sticker autos bug me. This is essentially Valor with more color and insert sets. This product would be rated much higher if it wasn’t rookie focused in terms of hits because I have all of this rookie class’s autos. They need a set in this price range with almost exclusively made up of veteran players. Topps Mis-Fires here with much anticipated release. Product features a new twist bit fails to deliver. This is same product as Topps Valor with some variations to set checklist the same hits can be expected. Topps promised an Autographed set checklist that would have a mix of Veteran and Rookies. Same veterans featured in Valor. The look is awesome but very average for hit seekers. I can’t believe another Topps football product with no Dallas Cowboys autos. I tested the product by picking up a $9.99 hanger box from Target. I was very impressed with what I pulled. lance graham � It looks like they may not exist. Not bad for a mid-end product. Design just a bit too busy for me but I’m happy with the ones I’ve gotten so far. Topps Fire card designs are unreal. For the people that hate it the product obviously isn’t for you. it’s a targeted series, not for everyone but my friends are all rushing to get them. Like the new card design. A bit retro akin to Skybox metal but a nice break from the basic card out there. Best product of the football season, just edging out Valor. Fire has a very bold design and a unique card for each player in the set. It is a lot different that what we normally see in the card world today. I would pick this up right away, as I’ve personally spent $100 on this in the first two weeks. For $80-$90, a hobby box is a bargain. With 4 hits (2 autos and 2 relics,) this box is cheaper than a Jumbo box of Series 1 and still provides more hits. A must!!!! All hail Topps!!!!!!!! All hail!!!! Don’t worry Kevin, the Cowboys will definitely have their fair share of autos/relics in all of the products next year. Considering we were NFC East Champs and won a Divisional Playoff Game. You can see the trend this year by looking at how companies are treating the Ravens. Go Cowboys! I agree with Stephen ^^ Best product of the football season. Well done Topps, cards seem to be more unique than your standard sets. I’ve bought a handful of retail boxes and 3 hobby boxes and every pack I open I’m seeing slightly different designs which look amazing. If you’re going to try to pull the big name rookie patch autos, stick to retail. I have noticed a common trend. The Beckham, Bortles, Bridgewater, etc., RPA’s are all being pulled out of blasters, hangers and retail packs. The only big name you can pull out of hobby is if you are lucky enough to hit a 1/1. Overall, not bad looking card. Fun to collect. Anyone have any idea of the print run of the fire autographs? I have only seen 2 jordan matthews, fa-jm on ebay since it was released. Just wondering how rare they are? Not bad. Card quality looks good. Just not the design for me. 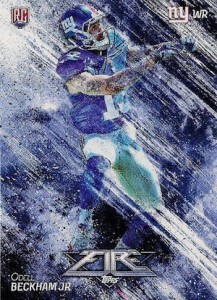 Probably my fav NFL card series from the past year, enjoyed collecting Fire a lot. 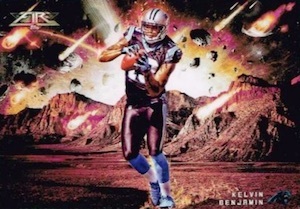 Kudos Topps, insane card art. Really hope this will be a continuing set not a one and done. The design grew on me. I like the different more artistic approach. That being said the sticker autos looks horrible with this product and there are barely any Cowboys on the checklist, 0 Cowboy Autographs. That is a fail. 2014 Topps Fire Factory Sealed Football Hobby Box Jimmy Garoppolo AUTO ?